Citation: C N Trueman "The bombing of Nagasaki"
Nagasaki suffered the same fate as Hiroshima in August 1945. The bombing of Nagasaki on August 9th was the last major act of World War Two and within days the Japanese had surrendered. Two senior American military figures – General Groves and Admiral Purnell – were convinced that two atomic bombs dropped within days of the other would have such an overwhelming impact on the Japanese government that it would surrender. Scientists at Los Alamos were also intrigued as to which type of bomb was the better – a uranium or plutonium based bomb. ‘Little Boy’ showed its effectiveness at Hiroshima but another bombing mission was needed to see what damage a uranium bomb could do. Nagasaki was not America’s primary target. This was Kokura. The three potential targets for a second bomb were Kokura, Kyoto and Niigata. Nagasaki was only added to a list of potential targets when Kyoto was withdrawn (it had been the secondary target for a second bomb) because of its religious associations. The third potential target was Niigata – but this was withdrawn from the list as the distance to it was considered to be too great. Therefore, the Americans were left with just two targets – Kokura and Nagasaki. Nagasaki was a major shipbuilding city and a large military port. But it was not a favoured target as it had been bombed five times in the previous twelve months and any damage caused by an atomic bomb would have been difficult to assess. Also, the way Nagasaki had grown as a port meant that the impact of a powerful bomb might be dissipated as the city had grown across hills and valleys. The city was also broken up with stretches of water. However, fate and the weather was to be Nagasaki’s undoing. Whereas the ‘Enola Gay‘ had had a relatively uneventful journey to her target at Hiroshima, the same was not true for the plane picked to drop the next atomic bomb – ‘Bockscar’. Both ‘Bockscar’ and ‘Enola Gay’ wereB29 Superfortress bombers. The crew of ‘Bockscar’ gathered for their takeoff at 03.40 hours, August 9th, at Tinian Island. The flight commander, Major Sweeney, found that one of the fuel pumps on the B29 was not working. 800 gallons of aviation fuel had to sit in its fuel tank – it could not be used for the engines but the plane had to carry its weight and get nothing in return from the fuel. ‘Bockscar’ carried an atomic bomb that differed from ‘Little Boy’ carried by ‘Enola Gay‘ for the Hiroshimabombing. 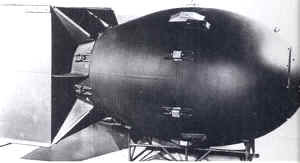 ‘Fat Man’ was not a gun-type bomb but used the implosion method; it had a circle of 64 detonators that would drive pieces of plutonium together into a supercritical mass. ‘Little Boy’ had used Uranium 235. ‘Fat Man’ weighed about 10,000 lbs and was 10 feet 8 inches long. It had the explosive capacity of about 20,000 tons of high explosives. By the time ‘Bockscar’ got near to its primary target, Kokura, it became clear that the weather had saved the city. The city was covered by cloud. Sweeney made three runs over the city but could find not break. With lack of fuel an issue, he decided to move to his only other target – Nagasaki. Sweeney only had enough fuel for one run over the city and not enough to fly back to Tinian. He would have to land at Okinawa. The weapons expert on ‘Bockscar’ was Commander Ashworth. Sweeney had been ordered that only a visual run was allowed – not a run guided by radar. Ashworth told Sweeney that radar would have to be used if Nagasaki was covered in cloud – it was. Most of Sweeney’s bombing run was done using radar but at the last minute a break in the cloud was found by the bomb aimer. He targeted a race track and at 28,900 feet, ‘Fat Man’ was dropped. As Nagasaki had been targeted in the past, people in the city had become blasé when the air raid siren sounded. The same was true on August 9th. The irony was that Nagasaki was well served with good bomb shelters and far fewer people would have been killed or injured if the air raid sirens had been listened to. The surrounding hills had tunnels dug into them which would have been very effective for the people who could have reached them. ‘Fat Man’ was a very effective bomb. Its blast was bigger than ‘Little Boy’s’ but its impact was reduced by the natural topography of the city. Where the bomb blast hit at its peak, massive damage was done. An area about 2.3 miles by 1.9 miles was destroyed but other parts of the city were saved from the blast. Curiously, the city’s train service was not interrupted and the fire damage that followed Hiroshima did not occur in Nagasaki as many parts of the city were broken up by water. The fires simply could not cross these gaps and they burned out. However, considerable damage was done to the city. The horrific injuries suffered at Hiroshima were also witnessed at Nagasaki. The city’s medical facilities were not totally destroyed by ‘Fat Man’ as at Hiroshima – but nobody was capable of coping with those who were injured in the blast. One survivor, Sadako Moriyama, had gone to a bomb shelter when the sirens sounded. After the bomb had gone off, she saw what she thought were two large lizards crawling into the shelter she was in, only to realise that they were human beings whose bodies had been shredded of their skin because of the bomb blast. Death and injury in Nagasaki and the surrounding areas, depended on where people lived. Those who lived on the Koba hillside, just three and a half miles from ground zero, were protected from the blast by a mountain. People caught up in the blast came to Koba for help and Fujie Urata, who lived in Koba and had seen a large flash, could not believe what she was seeing. She described people with great sheets of skin hanging off of their bodies; grotesque swollen faces; torsos covered with large blisters. As in Hiroshima, many in Nagasaki died after the immediate impact of the bomb had gone away from mysterious ailments which we now associate with radiation poisoning. No-one, understandably, knew what to do to help the victims of this newest of illnesses. In 1953, a report by the US Strategic Bombing Survey put the number of deaths at 35,000, wounded at 60,000 and 5,000 missing. In 1960, the Japanese put the number of dead at Nagasaki at 20,000 and the number of wounded at 50,000. Later, the Nagasaki Prefectural Office put the figure for deaths alone at 87,000 with 70% of the city’s industrial zone destroyed.